Well I am now back in Australia after a lovely weekend in Singapore. 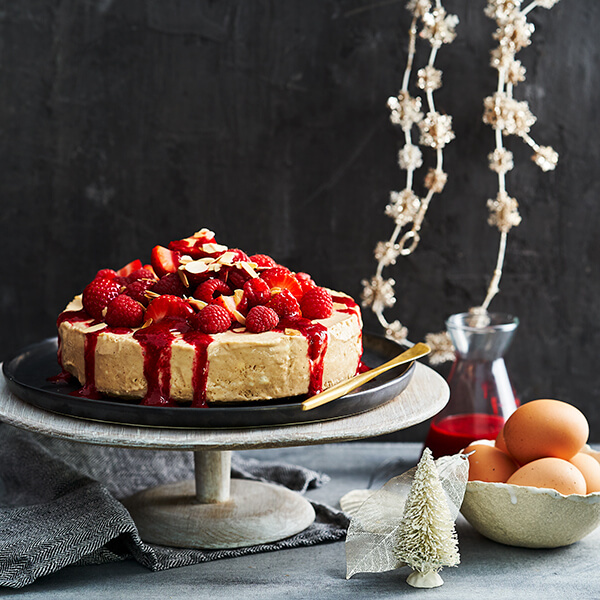 This newsletter is doubling up for both April and Easter – so April in season but lots of Easter recipes and information. I am looking forward to again cooking at the Sydney Royal Easter Show on The Australian Women’s Weekly Theatre Kitchen in the Woolworth’s Fresh Food Dome, daily from 3-3.40pm. Be sure to come and say hello if you are there. More about The Show later. Speaking of shows it was fun to be back on Studio 10, this time with Angela Bishop and Joe Hildebrand on Thursday, talking of my love of all things Irish: the food, the landscape, the history, the heritage and the friendliness of the people. Ireland has a contemporary food scene as well as wonderful tradition, so I cooked a modern dish based on Irish tradition: Salmon with Irish Potato Sauce and Green Onion Butter. colcannon is a traditional dish of mashed potato and cabbage and champ is mashed potato with green onions (shallots) to this was a quick dish, ideally suited to Autumn (or Spring in the Northern Hemisphere). You can watch the segment and get the recipe here. Visiting Ireland is also very special – the warmth and wit of the people and four major airlines fly direct from Australia. I flew in Monday night, just in time to host and MC a WOHO Sustainable Mentoring Lunch at NSW Parliament House. WOHO (Women in Hospitality) is an organisation that supports and fosters career development of women in the hospitality industry. WOHO has a mentoring programme for those in the industry, while Tasting Success operates through TAFE for female students and began with my approach to the then Minister for Women in 2005. So the idea was to draw the two together and also focus on no waste/sustainability. Vanessa Harcourt is Executive chef of Parliament House and a Tasting Success mentor and she allowed some of the mentees into the kitchen to help prep. 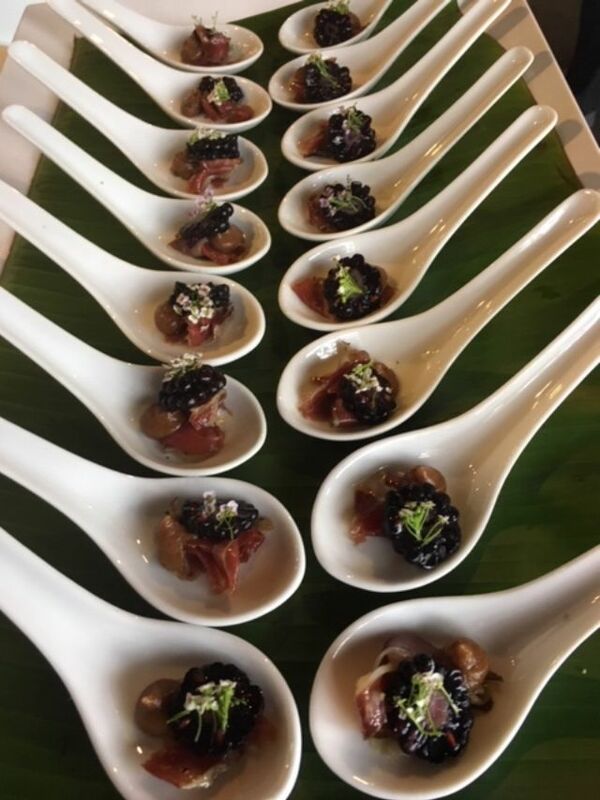 One dish was designed by Rachel Potter, one of last year’s mentees who is now working as the Wastefree chef. 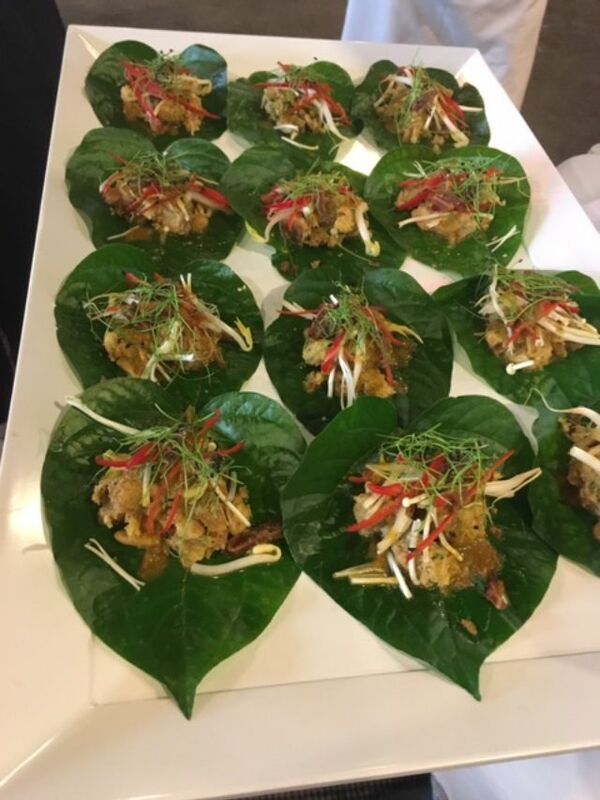 They were on a panel, along with Sheridan Marz Head Teacher Commercial Cookery and also manages the Tasting Success programme for TAFE. 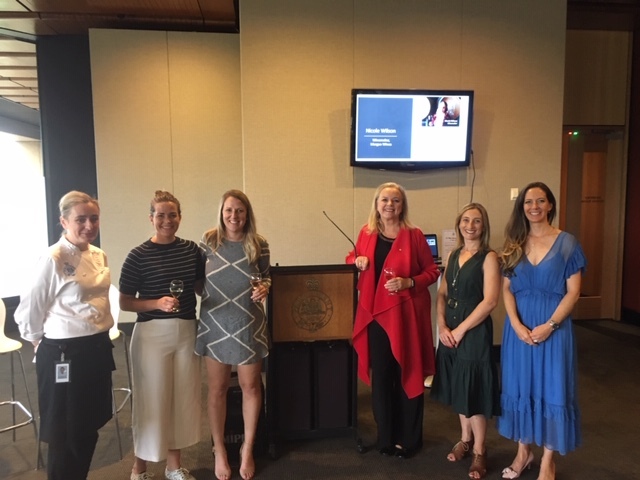 Wines were presented by Kate Sturgess from Brokenwood and Nicole Wilson from Margan Family Wines who also joined the panel. these wines are all worth looking out for! Poach, bake or microwave pears make an easy and elegant dessert. Try delicious Roasted pears with passionfruit and honey. Be sure to have a good supply of limes or lemons on hand for serving with your seafood this Easter. Despite their creamy texture bananas contain no fat at all. Bananas make an ideal snack and a delicious cooked, added them to pancakes, muffins, cakes or whip up a satisfying banana smoothie. Crunch into new season apples, select from Fuji, Pink Lady, Royal Gala, Granny Smith and Delicious or try the newer Jazz and Kanzi varieties a tasty cross between Gala and Braeburn apples, it has firm but dense flesh and a tangy, sweet flavour. Adding apple to a salad add texture and sweetness try this apple, carrot & cucumber salad with chicken skewers. Make the most of the last of the season’s super sweet figs. Use with 1-2 days of purchasing for maximum, flavour and quality. Snap up late season plums. Plums are delicious stewed. Combine sliced plums with granny smith apples, sweeten with a little sugar, top with a crumble mixture or serve cold with a honey yoghurt. Grapes are well supplied at the quality is good. Loads of varieties to choose from right now too, the Crimson seedless are extra crunchy, the Thompson seedless are perfect for school lunch boxes and the black muscats are loaded with flavour. Nashi are sweet, crisp and juicy. Nashi are superb served with soft cheeses or toss shredded fennel and nashi together to make a refresh slaw to serve with fish. Crops of new season mandarins from Gayndah and Mundubbera in QLD, have started to appear in store. 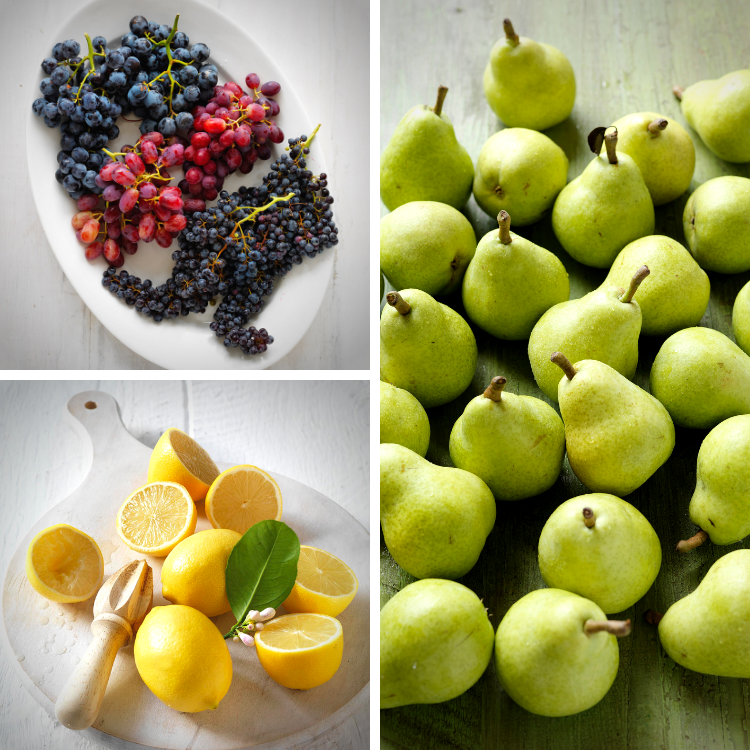 Fruit quality is varying from sweet and tangy to somewhat tart. Select plump, highly coloured, glossy skinned fruit that feels heavy for size. Be sure to fill a brown bag with fresh mushrooms to enjoy for sautéed buttons for breakfast, add them raw to a salad for lunch or serve full-flavoured jumbo flats on burgers with bacon for breakfast or lunch. Mushrooms are loaded with B group vitamins and a delicious teamed with a wide range of flavour. 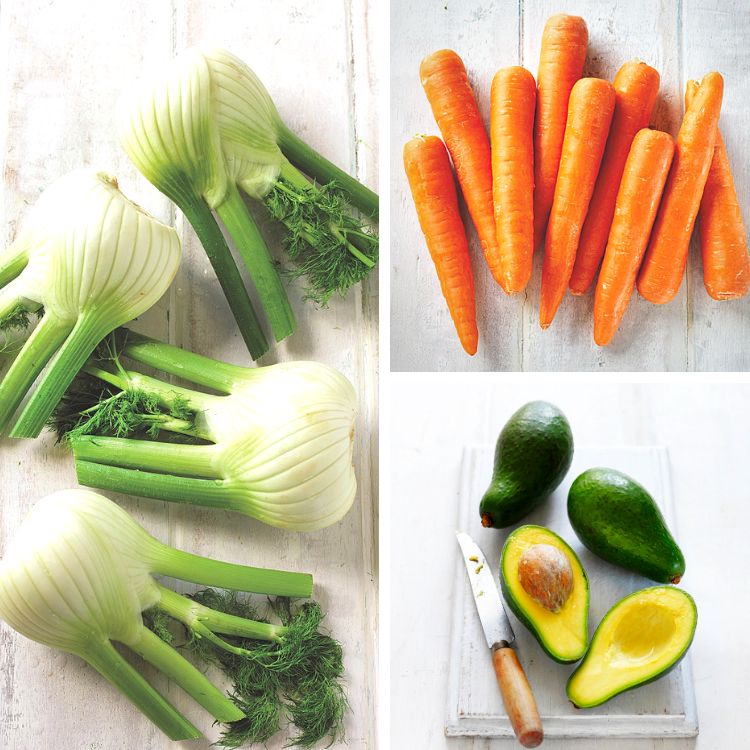 Bathurst grown cauliflowers flush in the cooler evening weather and this week there are good supplies of quality caulies, so pop a caulie on your trolley this week and whip up a 3 Cheese cauliflower bake or cauliflower leek and bacon soup. Fennel is a crisp, root vegetable with a delicate aniseed flavour. Delicious in soups, casseroles, salads it also complements lamb and seafood it also teams deliciously with pears and plums. Serve thinly sliced fennel as an accompaniment to a hot curry or simmer in vegetable stock and serve with chicken. Eggplant is an autumn favourite that stars in some many international dishes. While it’s delicious baked and served with Parmesan—eggplant shines in dishes from Greece and China, Indonesia and Tunisia. Try this eggplant, tomato and coriander salad, it’s delicious served with char-grilled lamb or chicken. Delicious roasted pumpkin can be served hot or cold. Roast pumpkin with the skin on or off as it’s a personal choice, but try sprinkling it with fresh herbs, Moroccan spice mix or combination of chilli and garlic embellish pumpkins natural sweetness. Jap, Butternut and Jarrahdale pumpkins are plentiful. The old saying carrots help you see in the dark is due to their high content of beta carotene, which the body converts to vitamin A and used for vision in dim light. Sweet and highly coloured carrots are a bargain especially when you buy a bag. This carrot and sultana loaf is scrumptious. March to June is the peak time for chestnuts as I have written before. Cooked chestnuts have a sweet, taste and a texture similar to roast potato. Chestnuts can be boiled, baked, grilled or roasted. The best eating chestnuts have a glossy brown shell and feel heavy for their size. Appetising sweetcorn is loved by all ages. 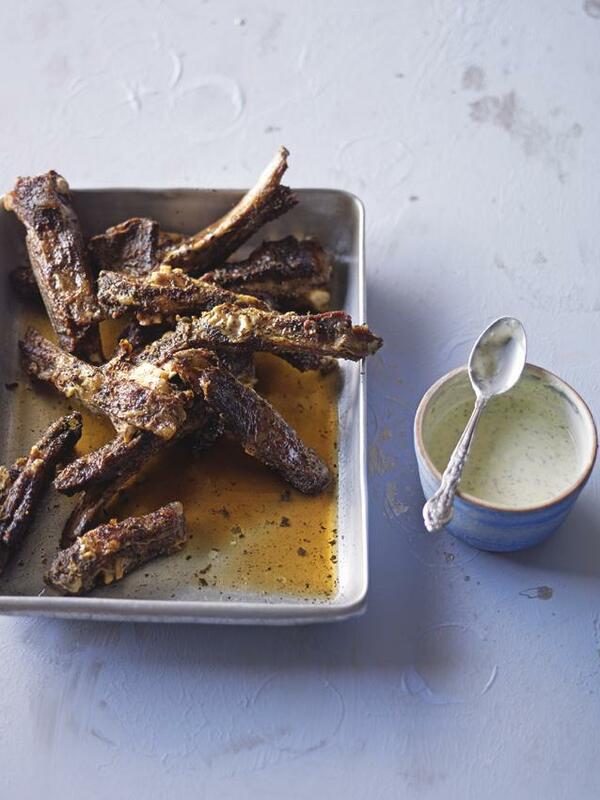 Plunge into a pot of boiling water and cook for 5 minutes, remove and serve with herb butter. The stunning orange flesh of kumara (sweet potato) is delicious boiled and served as mash or add to a pizza topping with feta cheese and wild rocket. Kumara is a good value too. If you enjoy a vegetarian meal then this carrot, kumara & cauliflower rojan josh curry is a healthy and delicious option. Silverbeet is a thrifty buy. Sauté chopped leaves in a little olive oil and crunched garlic, or steam trimmed leaves and add to a lasagne by laying the silverbeet with the pasta sheets, and meat sauce. 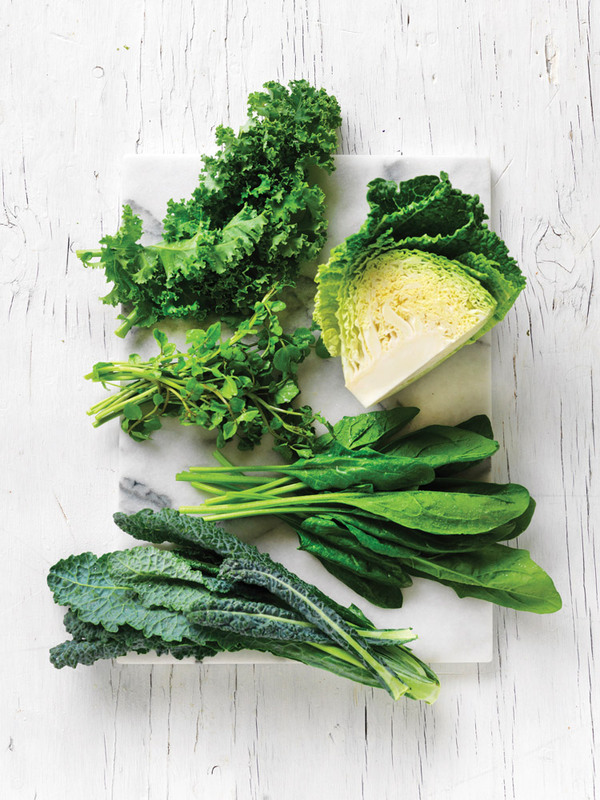 Silverbeet adds colour, flavour and vitamins A and C and extra iron to your diet. A stunning fruit bowl sensation, this healthy tropical fruit has deliciously sweet flesh and a watermelon-like crunchy texture. Dragon fruit is rich in antioxidants and contains vitamin C, calcium and iron. The flesh is juicy and delicately crisp. The tiny edible black seeds are a source of omega 3 & omega 6. There are two varieties with deep pink skin. One has speckled white flesh while the other has bright pink flesh and is the sweeter of the two. 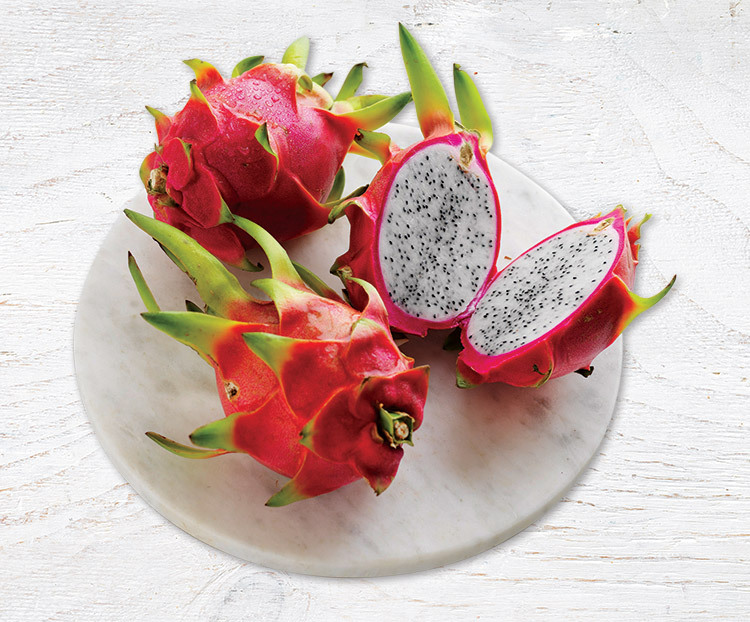 Choose dragon fruit that has even-coloured skin and feels heavy for its size. Leave at room temperature out of direct sunlight to ripen. Ripe fruit gently yields to pressure around the stem. Simply halve dragon fruit lengthways and scoop out the flesh. Discard the bitter leathery skin. Team dragon fruit with other tropical gems such as pineapple, papaw and passionfruit for a colourful fruit salad. 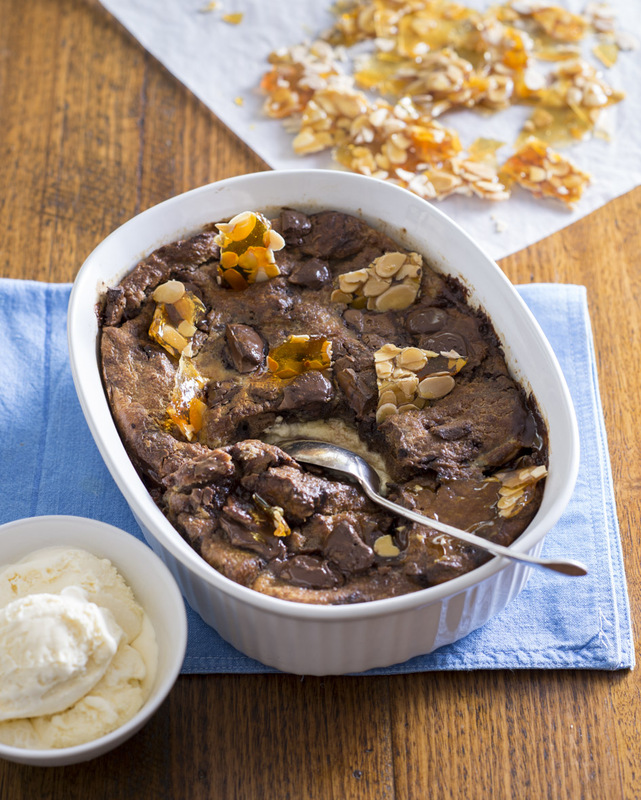 Recipe from the award-winning TV series and book, Lyndey Milan’s Taste of Australia. Heat stock in a saucepan or microwave. Reduce the heat and maintain at a simmer. Heat the olive oil and half the butter in a large heavy-based frying pan over moderate heat. When the butter has melted, add the leek and fry for a minute or two without browning. Add the garlic and cook, stirring frequently, for a minute more. Add the rice and stir well to coat with the oil and butter (it will take on a glassy appearance). Add the wine and stir until it has evaporated. Reduce the heat to low and add one ladleful of hot stock. Stir constantly until the liquid is completely absorbed. Keep adding the stock, a ladleful at a time, stirring and waiting until it has been completely absorbed by the rice before adding the next ladle. Keep it cooking at a low simmer. After about 15 minutes taste a few grains of rice: it should be tender, not soft, yet still a little firm to the bite. It will probably take around 20–25 minutes to reach this point. When the risotto is ready it should still be a little liquid, not dry like fried rice. Taste for salt and pepper and stir through with remaining butter. Meanwhile, place consommé, thyme, garlic, lemon rind and salt and pepper in a large saucepan. Add chicken and top up with water to cover. Stir. Bring to the boil then reduce heat to medium and poach the chicken for 15 minutes or until cooked through. Remove chicken from liquid, reserving liquid. Pound herbs in a mortar and pestle until broken up. Add olives and lemon zest pound some more. Mix through olive oil and verjuice, then lightly crush tomatoes and mix to combine. Ladle risotto into a serving bowl. Cut chicken into strips or medallions and toss through herbed dressing. 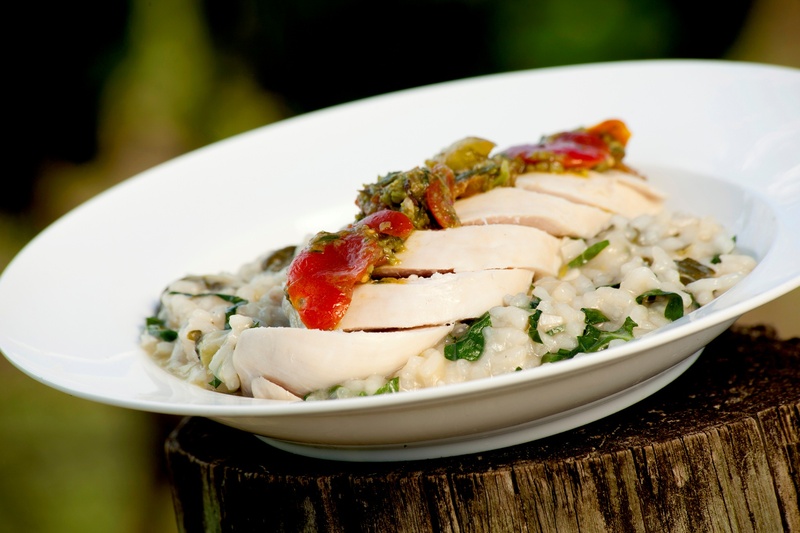 Place on top of risotto. ¼ cup (60mls) cold waterPreheat the oven to moderate (180’C/160’C fan forced). Grease a shallow 2-litre (8-cup) ovenproof dish. Spread cut surfaces of buns with butter. Sprinkle with Easter egg (optional).Combine the milk, cream and sugar in a small saucepan. Stir over heat until hot. Whisk eggs in large bowl. Gradually add hot milk mixture as you whisk. 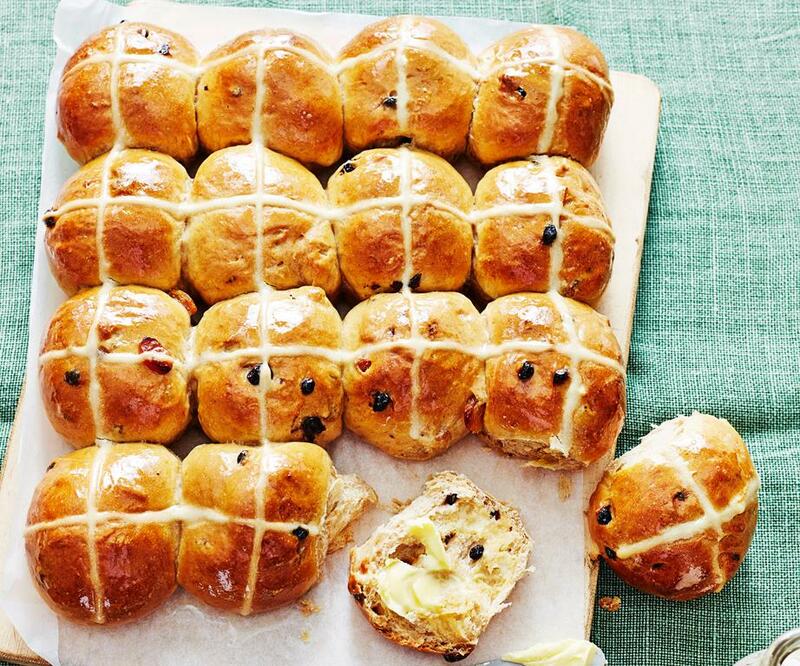 Pour hot milk mixture over the hot cross buns. Leave to soak for at least 10 minutes, pressing down with your fingers occasionally to help the buns soak up the liquid.Place the dish in a large baking dish; add enough boiling water to come halfway up the sides of the ovenproof dish. Bake, uncovered, in moderate oven for about 45 minutes or until pudding almost sets. Remove the pudding from the baking dish; stand 5 minutes before serving.Meanwhile make the praline: Line a baking tray with baking paper. Scatter over the almonds and place in the oven until golden about 5 minutes. Meanwhile combine sugar and water in a saucepan and place over low heat. Cook, stirring, for 5 minutes or until sugar has dissolved. Increase heat to high. Bring to the boil. Boil, without stirring, for 5 to 7 minutes or until mixture turns golden. Remove from heat. Set aside for 2 minutes to allow bubbles to subside. Pour over almonds on the baking tray. Allow to cool. Break praline into shards.Serve pudding sprinkled with praline. Tip if you don’t have a baking dish large enough to hold the ovenproof dish, make sure you soak the custard into the buns for at least 10 mins so that it begins to set and reduce the temperature of the oven to 170’C (150’C fan-forced) and cook a little longer. Also have a bowl or sink of cold water ready so if your toffee for the praline starts to burn, you can put the base of the saucepan in the cold water and stop it cooking. Regular readers will know that I am a self-confessed Easter Show tragic. I love it and everything about it. My parents courted there and we went as children. I was honoured to the the third woman elected to the Council of the Royal Agricultural Society of NSW in 1996 but I began doing cooking demonstrations at the Show long before that, in 1987. I still have those recipes. 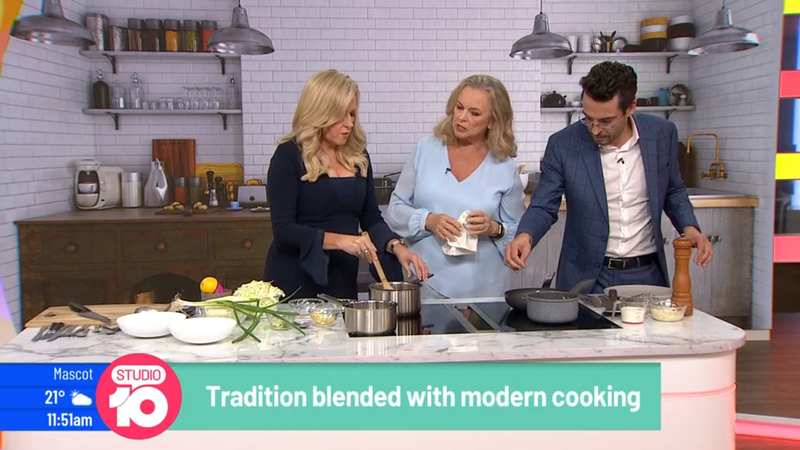 This year I am delighted to be hosting cooking demonstrations for Steggles every day from 3pm – 3.40pm in The Australian Women’s Weekly Theatre Kitchen in the Woolworths Fresh Food Dome. 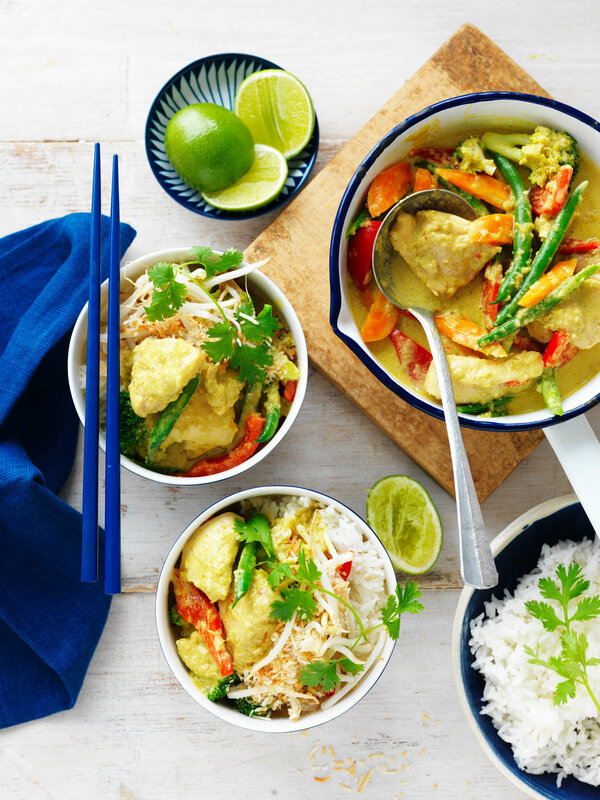 It promises to be a fabulous demonstration as I take a whole family roast bird and show you how to break it down into breast, thighs, drumsticks and wings and then prepare three different recipes: Southern style crisp chicken tray bake, Cheesy chicken pockets and the lovely Jungle curry (pictured) which is what you will be able to taste. This is a really cost effective way to use a family roast size chicken. Steggles are all about the family and sharing quality time around the table for memories which will last a life time. I’ll have some special guests who will share their memories of family meal times. There will be recipes to take home, fun and prizes so do come along and say hello. Of interest to readers, anywhere is the shorlist from the prestigous Fortnum & Mason Food and Drink Awards. What sort of a wine drinker are you? The Shout writes The characteristics of Australian wine drinkers revealed. First time in 20 years the Sydney Royal Aquaculture Competition will be judged in front of a public audience. 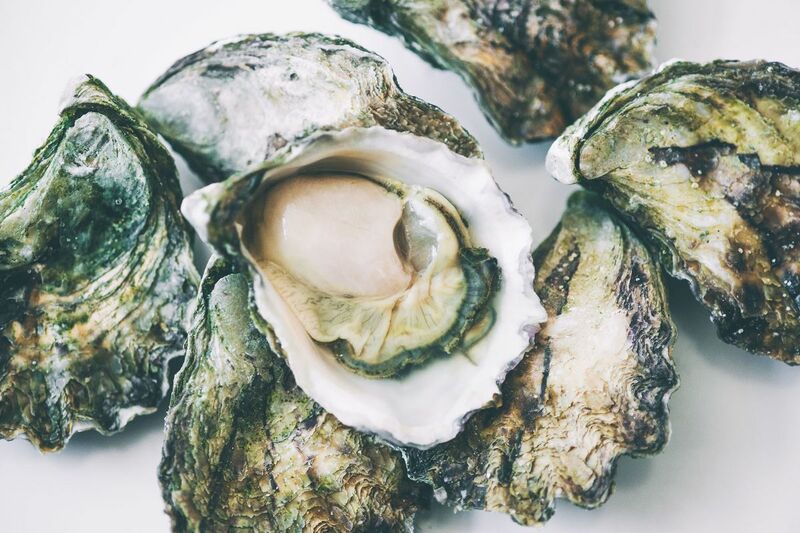 Come and hear the judges and learn what makes a really good oyster or farmed prawn. It’s all happening on the first day of The Easter Show. The Woolworths Fresh Food Dome opens at 9am so make your way straight there. I’m MCing the event so say hello. 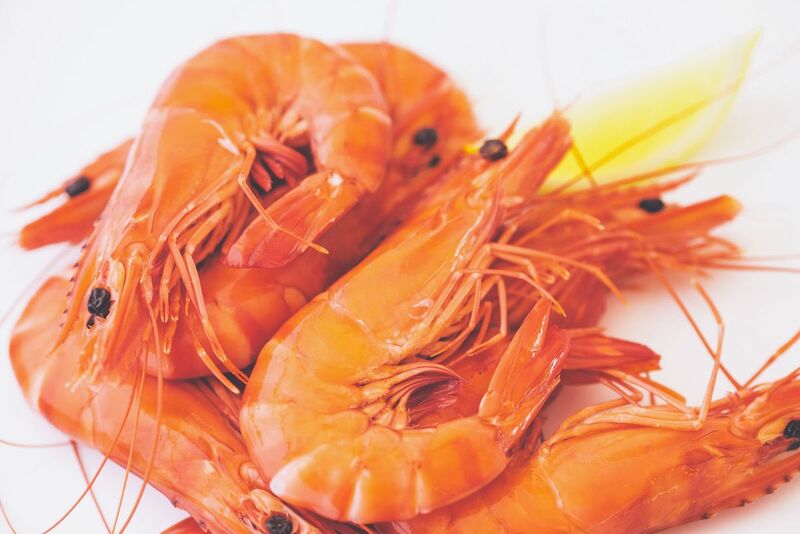 For the very best of seafood at Easter you might like to order from Josh Niland’s Fish Butchery. Fall down the rabbit hole with Anna Polyviou at her fantastical Easter Garden for a High Tea Picnic at Shangri-La Hotel, Sydney, from 30 March to 29 April, 2019. The sweet-laden Easter garden will entertain with a mini maze, towering bunny rabbits, colourful eggs, pretty in pink flamingos, mad hatter clocks, spotty mushrooms, and whimsical tea tables. By night, enjoy a tête-à-tête with a cocktail picnic basket for two, and nibble on savoury morsels such as cured meats, Australian cheese, moreish olives, fluffy quiche, and the freshest fruit. Easter breads are a wonderful tradition. There are so many from Chorek (Armenia) and Kringel (Estonia), to Osterzopf (Germany) and Tsoureki (Greece).Women’s Weekly Food share their best ever Easy hot cross buns recipe. And when I was Food Director of The Australian Women’s Weekly, we took a lot of trouble to develop the recipe for Little Portuguese tarts. I am very excited to announce this bespoke 12-day itinerary where I am partnering with By Prior Arrangement. I first went to Morocco in 1978 and then again on an amazing food trip in 1994 with the International Olive Oil Council and have been entranced by the place ever since. 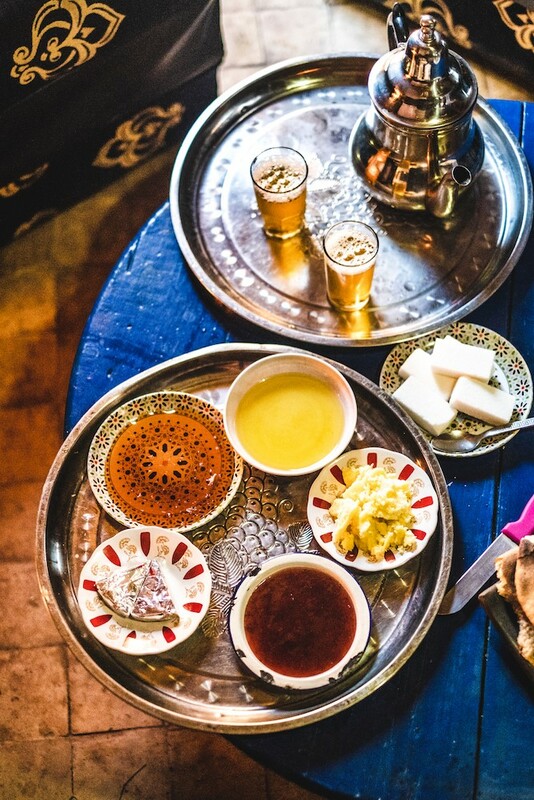 Morocco is an extraordinary destination, but one best visited with specialised knowledge and contacts to ensure a happy and seamless experience. Carol Prior of By Prior Arrangement focusses only on Morocco, a country she has known for 30 years and where she lived for over a decade. I could think of no-one better to plan the tour with. This trip will see you travel from Rabat the capital, to spiritual Meknes and Fes, and to Marrakech the red city. On the way you will explore the archaeological site of Volubilis, hike or ride a mule to a Berber village in the Atlas Mountains, and relax by the coast in tranquil Essaouira. 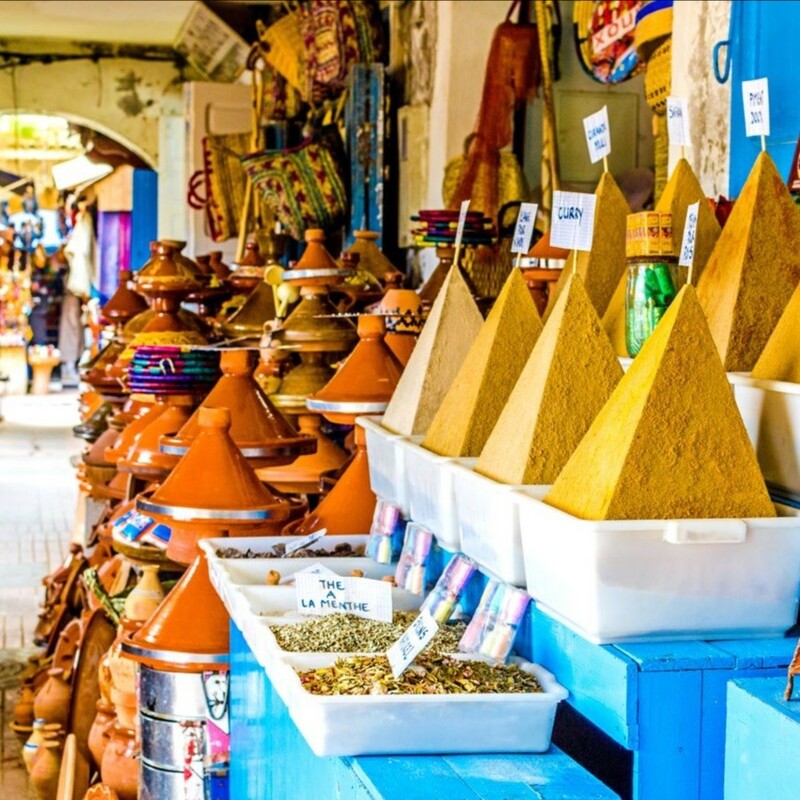 You will discover the delicacies of Moroccan and French food, dine in local eateries through to upmarket restaurants, and experience the making and flavours of Moroccan dishes during cooking classes. 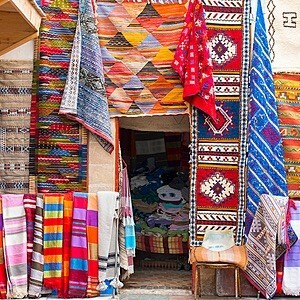 Your luxury accommodation is in charming, authentic riads. I have a very busy time coming up with the Easter Show, so there won’t be an update next week. Follow my food and travels on Facebook, Instagram, Twitter and Pinterest.